Congratulations to the winners of PR Daily’s 2016 Corporate Social Responsibility Awards! We asked to see work that displays your organization’s integrity, authenticity and intention. You showed us your unique, creative strategies for communicating the heart of your business’s passion for community service. We were impressed by your ability to think about the bigger picture and execute campaigns that moved audiences around the world. You demonstrated a determination to bringing to light the issues that affect your community, industry and society at large. We are pleased and honored to recognize you as an industry leader who uses your talents for the greater good. To everyone who entered this year’s Corporate Social Responsibility Awards, thank you for sharing your campaigns with us. 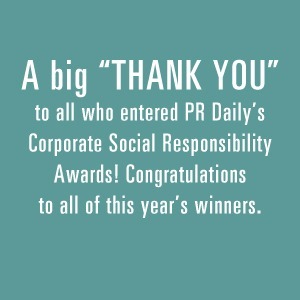 We are proud to announce below the winners and honorable mentions of the 2016 Corporate Social Responsibility Awards with this Special Edition of PRDaily.com! Corporate Organizational Transparency, NAC, Inc.